Hi kittens, we’ve made it to another weekend and instead of a rant, how about I just let you get straight to the goodness? There’s a lot of news and fun links this week, but as always, please share your favorite stories, memes, and links from the week in the comments! Let’s start off with something cute and purely delightful, shall we? An ode to the fake fur coat. So much for seeing the courts…in court. Travel Ban 2.0 was rolled out this week with, it must be said, what looks like some actual thought put into the process and application this time. It’s still garbage. If the ostensible goal is to protect Americans from “radical Islamic terrorists,” the administration has still failed utterly to prove that citizens and refugees from these countries posed a heightened significant entry in the first place. The terrorists or their sympathizers who have carried out violent actions in recent years seem to be made in America, as little as we apparently like to acknowledge that fact. Iraq, the birthplace of ISIS is off the restricted list seeing as they are, ya know, our ally. Meanwhile refugees are going to have to go through a more stringent process than ever before, even though those most needing assistance are the least likely to be able to pass background checks seeing as how (to take Syria as an example) their entire nation state and all its attendant bureaucracies, paperwork, legal histories, and documented evidence have been bombed to oblivion. Meanwhile, I believe there is plenty of evidence of animus towards muslims in statements from the president and his supporters to warrant challenges. No amount of deleting can un-tweet your tweets, Mr. Stone. This sounds like a fascinating project and I wish I could see it. My own representative, Congressman Chaffetz, continues to be the living embodiment of the word “craven,” and his latest gaffe was a right doozy. Let’s set aside this annoying and frankly damaging trope that (presumably) poor people are just irresponsible with money/services and therefore it’s a bad idea to provide them…his math is a joke. Does he live in a world where poor people, to say nothing of working and middle class citizens, buy phones every month? Nay, more than that! According to the National Conference of State Legislatures last year, the annual premium costs for an average family were $18,000. Meaning that you’d have to buy a new iPhone once a month for three years in a row for an equivalence. Meanwhile, I’d like everybody who has ever had a single prescription or procedure cost more than $500 to put their hands up. This whole story is such a load of sexist garbage. And it’s disheartening. Also, give this reporter a gold star for questioning why the president is calling for an investigation…if he already is in possession of conclusive evidence that this tapping happened? As I see it, either President Trump lobbed in a completely fabricated conspiracy theory (which in itself should be a scandal as it questions not just where he’s getting his information, but whether he can tell fact from fiction), or he revealed that he/his organization have been the subject of investigations (which is likely also going to be a scandal depending on what he/they were being investigated for). Either way, self inflicted wound. Got my dose of beauty therapy from sighing lustfully over these statement earrings. A great new piece of art landed on Wall Street just in time for IWD. I wish I could see the Trump/Clinton gender swap performance too. It sounds like it gives a real insight into gender politics and gendered communication styles. Loved the piece about the fur coat. I admire women who have a distinct style. Mine is fairly dull, I'm afraid. But I'm so glad that I work somewhere where the standard 'uniform' is jeans and a T-shirt (with the exception of client meetings). I'm curious: who is the dog in your header photo? Are you dog-sitting? Alas no, we’re not dog sitting. 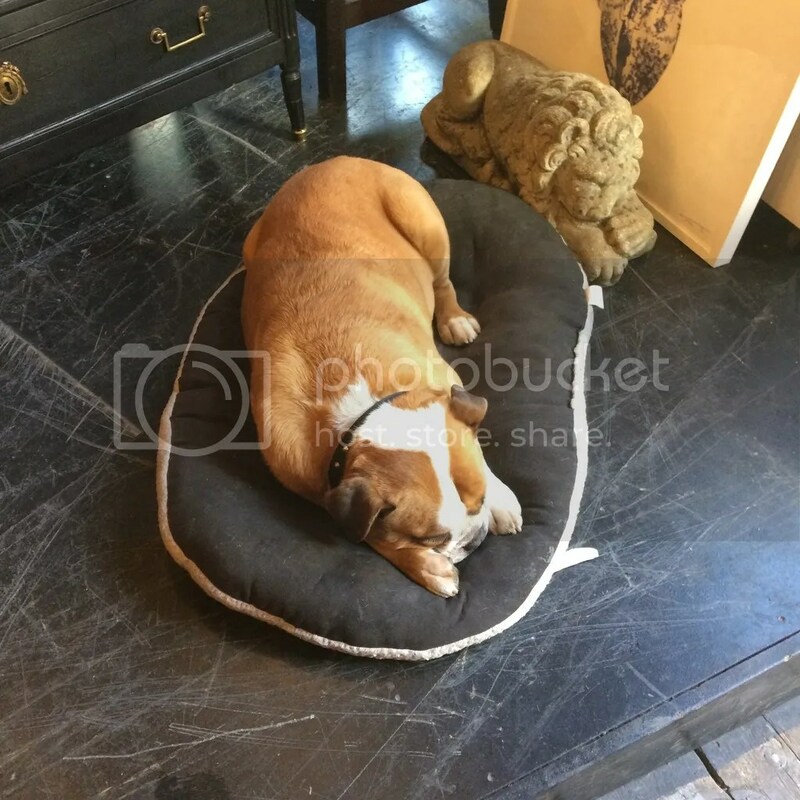 This is a shop dog we ran into at an antiques/gallery space in Hoxton. I kind of fell madly in love with him and grabbed a shot (with the owner’s permission) on Instagram. We’re not allowed to have dogs in our new place so I get my kicks in from other people being generous with their puppies…or monasteries, apparently! Style is so subjective and a surprisingly difficult thing to identify, quantify, and master; it would not surprise me in the least if you’re a lot more “stylish” than you’re giving yourself credit for. Comfortable and happy with yourself is definitely not a bad place to be, and is totally a “look” of its own! I’ve got another month long project based around style coming up soon actually and this has been on my mind a bit so I’m really curious to hear your thoughts…if I can get the project to behave itself long enough to get written! WANT ALL THE EARRINGS! I like the leopard-spotted version of that one even more. That video is amazing, and thanks for finding and sharing it — the NYU thing. It’s very true that women keep smiling when they want to throw things instead, and that FAKE smile can be deeply misread and acceptance, agreement or approval when it’s more of a gritted teeth moment because an angry woman terrifies everyone.